Memories begin to haunt Darcy when a new boy arrives at her high school, and he makes her feel both desire and desired in a way she hadn’t thought possible. But Conn’s interest in her is confusing. It doesn’t line up with the way he first looked at her. 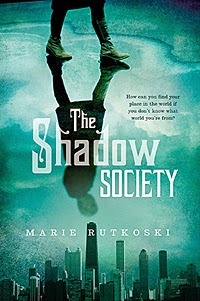 In this smart, compulsively readable novel, master storyteller Marie Rutkoski has crafted an utterly original world, characters you won’t soon forget, and a tale full of intrigue and suspense. This book was a real disappointment for me. There's been so much buzz about the author's The Winner's Trilogy that I thought for sure this earlier book of hers would be a good read. 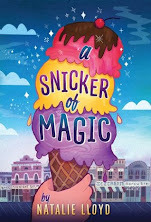 Unfortunately, it was predictable, slow, uninteresting, and fell victim to many of the predictable young adult tropes. I was intrigued for the first little while, I will admit. The writing was fairly solid in the beginning, and the premise was interesting. Parallel worlds? Supernatural creatures? Political intrigue? Sign me up. If all of these things had been handled well, this might have been an amazing story. The characters were all pretty bland, and I found that I really wasn't invested in any of them. Darcy is supposedly an artist (though when she thinks oil paint can dry in the time it takes to eat a plate of pasta, you have to question how much she actually knows about her hobby). Unlike so many other young adult heroines with artistic hobbies, she actually does quite a bit of art throughout the story. She sketches weird Chicago skylines in her notebook. She builds a sculpture for her English class. She paints her underground bedroom with oil paints (don't ask how she doesn't asphyxiate from the fumes; she also has a mature oak growing in there, without any sort of sunlight, so I don't think the author was going for plausibility). The beginning of the story starts out almost like Twilight, with a mysterious, broody, hot (of course) guy who appears at Darcy's school. This is Conn, who Darcy ends up hating, then loving, then leaving... because she blames herself for something she had absolutely nothing to do with. She's one of those tiresome heroines who beats herself up throughout the story for very little reason. Conn is the standard young adult love interest, already an expert in his chosen career at the age of nineteen. Most of the other minor characters I didn't really care about. Even the villains were too stereotypical and/or boring to be of much interest. The writing in the first part of this book wasn't too bad. Actually, I thought it was pretty strong. Things did eventually go downhill, but not until much later. I nearly had a conniption at 87% after finding three comma splices in the dialogue within a couple of pages. I have no idea what happened at that point; it was like the editor threw up his/her red pen and said, "Eh... I'm sure the rest of it's fine." Before that, there were just the usual (and expected) misused words and homophones. I can't really recall a young adult book I've read lately that didn't have any of those. I wanted to like what sounded like an interesting story, but I just didn't, and I can't recommend this one, either. Even worse, I'm now questioning whether I want to read The Winner's Trilogy at all; if the same problems that were present in this book are present in those ones, I probably won't like them. Conn didn't reply, but there was a rebellious glint in his gaze. Then he stood and headed for the door. For a moment, I couldn't move. I felt rooted in place, like I had truly become part of the tree and would grow with it, like my perception of Conn was growing, changing, putting out tender new twigs, green vines, baby leaves tightly curled. OH NO. THIS IS BAD NEWS. I actually didn't know this author had more books, which is stupid of me. xD But I really was "meh" about The Winner's Curse, but then The Winner's Crime was like a 5-star book for me so...I don't know! I'm tempted, but I'm cautious. I'll probably add it on Goodreads and then just see what happens. ;-) There's seriously too many books to read though. I NEED A CLONE. I know. So many books, and not enough time to read them all! That's why I'm hesitant about trying the author's other books now. I need some sort of way to pare down my TBR list; unfortunately, that may mean removing books that are written by authors I wasn't all that impressed by. I'm still curious about The Winner's Curse, though. Argh! What to do?